As roads are developing, so do our maps. 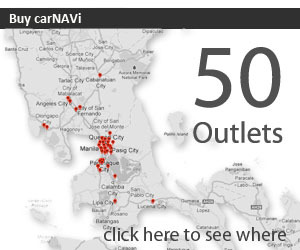 Have your carNAVi as fresh as new, download and install the latest 2017 GPS map update for the Philippines. As usual we offer just one easy to use installer that serves all models and is available for Windows and Mac OS-X. Update now to get latest roads incl. NAIA Expressway for the best navigation results with your carNAVi. First city maps are available in the carNAVi Store map section. Only with carNAVi you can travel the world for free. Available right now are detailed GPS maps for Los Angeles, San Fransicso, Salt Lake City and the Grand Canyon area with more to come soon. Map updates for our Apple users are already available quite some time. We add some effort to enlighten our Mac support and from now on all additional carNAVi maps in the online store are available for Apple Mac OS-X, as well. We made it as easy as possible, just select your desired operating system to receive the installer during download. Our new skin ‘Boulder’ for example displays the maps in colorful pastel tones during day mode and in night view the roads and map elements are displayed in neutral grey tones which may better blend in with your existing car cockpit design. Just try it out, the installation is easy.